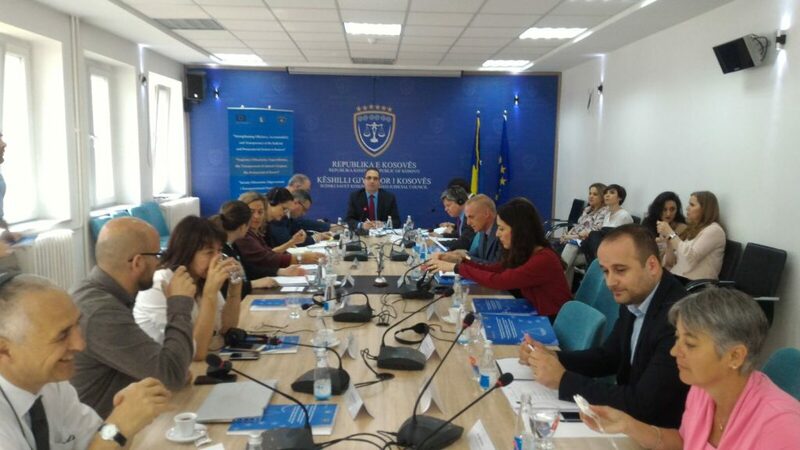 On April 12th, Ms. Stefania Lentinello, Program Officer of the Siracusa International Institute for Criminal Justice and Human Rights, attended in Pristina the 6th Steering Committee of the Twinning Project “Strengthening Efficiency, Accountability and Transparency of the Judicial and Prosecutorial System in Kosovo”, funded by the European Commission. The project is conducted by the Italian High Judicial Council in cooperation with the Italian Ministry of Justice; the French Ministry of Justice, represented by Justice Coopération Internationale (JCI), is junior partner of Italy. The Siracusa International Institute is the ad hoc mandated body of the Italian High Judicial Council (CSM) supporting the scientific and logistical management of the project. The overall objective is to contribute to the Rule of Law in Kosovo by strengthening the independence, efficiency, transparency and sustainability of the judiciary and prosecutorial system. The Committee was also attended by the project’s leaders, Mr. Giulio Adilardi, Mr. Yves Charpenel, and Mr. Lavdim Krasniqi; the EU Office Task Manager, Ms. Julia Jacoby; the Chair of Kosovo Judicial Council, Mr. Nehat Idrizi, the Chair of Kosovo Prosecutorial Council, Mr. Blerim Isufaj, and the resident twinning advisers, Ms. Mariaemanuela Guerra and Roberto Amorosi. The discussion of the Steering Committee focused on the results of the activities conducted in the last quarter of implementation of the project and on the objectives planned for the next three months. The Siracusa International Institute for Criminal Justice and Human Rights is an Italian NGO dedicated to education, training and research in the fields of international and comparative criminal justice and human rights.